The YAC boys lacrosse program is designed to provide a safe, fun, developmental program for children in grades K through eight. Each of our divisions offers a different degree of competitiveness, however we strive to develop a child’s love for the game so that he can truly appreciate all aspects of the sport, gain an understanding of sportsmanship, and learn what it means to be part of a team. Each level of the program is outlined below. I hope that this document offers some insight into our philosophies and what we strive to achieve. 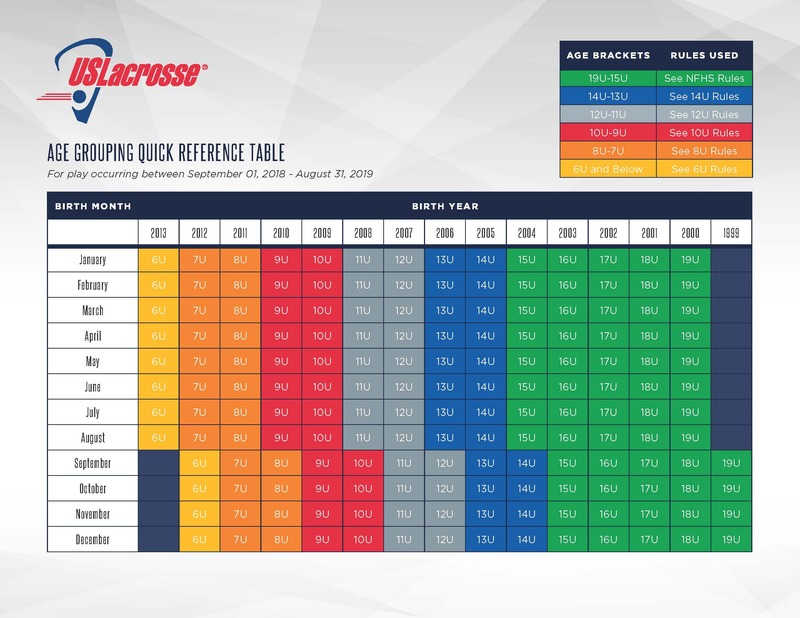 In addition to this document, you should also review our lacrosse code of conduct and the history of the Yorktown lacrosse program and community. These documents are designed for all players, parents, and coaches so they may enter into this program with a full understanding of expectations, and of the importance the lacrosse program plays and has played in the lives of some many people in town. The Yorktown lacrosse community is one of the strongest and most successful in the country. Enjoy your child’s experience. US Lacrosse is recommending younger kids play 7v7 on smaller fields. We will focus on 7v7 in Bantams and under so the kids get more touches with the potential for some full field games. Your child's birth date will be the first criteria used to determine division placement. However YAC will give the parents permission to decide to have their child stay with their grade if their birth date allows for that option. 1. When does the season start/finish? The spring season starts as close to the beginning of April as weather and field conditions permit. If the weather is good, we may start in late March. The season runs until the first week of June and will end with a year-end celebration held at Sports Barn. 2. Where and when are practices and games held? Practices are held at a variety of locations. Most however are held at either Granite Knolls, Legacy Field, Sports Barn, Yorktown School District Fields, or FDR Park and can occur between 5pm and 9:00pm on weekdays. We are also attempting to reserve alternate arrangements, but the status of those facilities is unknown at this time. Home games are held at Granite Knolls, Legacy, Sports Barn and on a limited basis at the Yorktown High School. All divisions also play away games against towns throughout Westchester and Putnam with some teams playing teams in Connecticut and Long Island. Games can be played any day during the week, including Saturday and Sunday. Weekday games may start at 6:00pm. Weekend games may start at any time. 3. What is the required equipment each player MUST wear? Lacrosse is a contact sport and as such it is mandatory that each player have the following equipment. The YAC does not provide any of this equipment. d. Shoulder pads - lacrosse style, not football. g. Athletic Supporter with cup. i. Cleats – optional but preferred. 4. Why is there a separate amount required for US Lacrosse? US Lacrosse insurance is required for each league that we play in and for all tournaments. Without this insurance your child will not be allowed to participate. Mighty Mites (7U/ K-1st grade) The Mighty Mite division is operated in a clinic environment and is designed for Kindergarten and 1st graders. Basic skills like throwing and catching will be taught, along with basic fundamentals of the game. The clinic will be held on Sunday morning. During the season it is possible that the K/1st graders may play a modified scrimmage within the clinic group. Contact is limited at this age group, though at any age lacrosse remains a contact sport. Pee Wee (8U/ - 2nd and 3rd grade) – The Pee Wee division is operated in a clinic environment and is designed for 2nd graders and those 3rd graders that have not played before. Basic skills like throwing and catching will be taught, along with basic fundamentals of the game. The clinic will be held on Sunday morning. During the season it is possible that the 2nd/3rd graders may play a modified scrimmage or two against neighboring towns. Contact is limited at this age group though at any age lacrosse remains a contact sport. Bantam (9U/10U - 3rd and 4th Grade) – In this division, based on preliminary registration numbers we are planning to field three teams of equal talent. These teams will play each other and other towns in Westchester, Putnam and Dutchess counties and Connecticut . The target is for each team to play ~10 games plus some additional jamborees. Fundamentals of the game are stressed, as is full participation for each player. Each player may get an opportunity to play each position on the field. Games scores are kept, but the winning of the contest is secondary to the development of each player. Junior (11U/12U - 5th and 6th grade) and Senior (13U/14U/15U - 7th and 8th grade) – The structure of these divisions is dependent upon registration numbers as well as coaching availability. The Junior division will consist of one Husker team for 6th grade, one Husker team for 5th grade and one 5th/6th team (see below) Those players who are selected for the Husker team will not play on the 5/6 Balanced team. All teams in these divisions will play other towns in Westchester, Putnam, Rockland, Orange and Dutchess counties and Connecticut and Long Island . The target is for each team to play 10-12 games plus some additional jamborees. Each team will have a minimum of 2 practices a week. Balanced – Our plan is to field two or 3 balanced teams at each level, but can change based on registration. These teams will play in the Hudson Valley league and will compete against teams from Westchester and Putnam counties. We will continue to stress development of the fundamentals of the games and equal participation is required. Husker - There will be one 6th grade Husker team, one 5th grade Husker team and one 7/8th Husker team this year. A separate notification will be sent with details, requirements, dates and etc. so players can register for the Husker tryout. This team will be selected as a result of a tryout and will play a more competitive schedule and will also participate in jamborees. Participation on this team is not mandatory but everyone who registers for the division and meets Husker requirement is eligible to tryout. If you are not selected for the Husker team, you will be assigned to one of the Balanced teams. In an effort to optimize our coaching expertise and the further development of our Husker travel teams YAC Boys lacrosse has a restriction that all athletes who play on the Husker teams must reside within the Yorktown Central School District. Please note: For those players who are not selected for a Husker team: Each week a small number of players who were not initially selected may get an opportunity to play in a Husker level game to gain some experience. This is optional as we realize this is not for everyone. We will reach out to the various division coaches for feedback on which kids are working hard and would appreciate the opportunity to play against a higher level. The goal is to get a larger number of kids experience playing at a higher level while also giving them an environment to continue to develop their skills within a Balanced environment. The Husker teams will continue to stress the fundamentals of the game, and will compete against teams in Westchester, Putnam, Dutchess, Rockland and Connecticut and Long Island. For all divisions, winning of the contest is secondary to the development of ALL players. Saturday morning skill development and free play: On Saturday mornings we will be organizing skill development time which will consist of drill stations and position specific training to be followed by free play for all the players. The players will choose mixed teams and play some fun short field games.